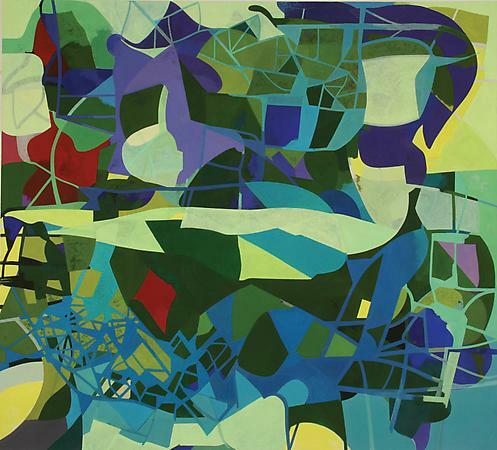 Neil Anderson, Summer Evening, 2011, Oil on Linen, 76 x 84"
Bridgette Mayer Gallery will participate in the 2011 edition of Art Miami, which opens on November 29th in Miami’s Wynwood district and runs through December 4th. This is the second year that the Gallery has been in Art Miami and the third in which the gallery has participated in a major fair in Miami. Bridgette Mayer Gallery will be located in Booth C31. The Gallery will exhibit important works by Sam Francis and Kenneth Noland, Jim Dine and Pat Steir, alongside work by contemporary artists from the Gallery’s roster. Large, colorful abstract paintings by Neil Anderson and Charles Burwell will figure prominently in the Gallery’s booth, along with new tape works by Philadelphia artist David Slovic. The Gallery will also feature recent photographs by gallery artists. Paul Oberst in collaboration with photographer Patrick McNamara, will showcase two new triptychs from his “Banded Men” series, and new sculptural wall works by Oberst. Spanish artist German Gomez will exhibit selected works from his 2007 “Compuestos” series of portrait photographs. New gallery artist Eileen Neff will show four examples of her digitally altered photographic landscapes. Steve Tobin will again have a major presence outside of the fair tent. Tobin is perhaps best known for the Trinity Root, the first and only 9/11 memorial near Ground Zero in Lower Manhattan. The famed bronze casting of "the tree that saved St. Paul's Chapel" on that fateful day is permanently sited at the corner of Wall Street and Broadway, and has attracted millions of visitors since it was installed on the four year anniversary of the attack on the World Trade Center. Tobin has created new pieces in steel from his Steelroots series especially for the fair. Meticulous craftsmanship and a deep response to nature lie at the heart of these works.